Checked weight of the Meru inlay is exactly 150 grams as stated by Meru. Rectangular shape of the sleeping bag with wide entrance. So what is the purpose of an inlay sleeping bag? There are 5 major advantages. First and foremost, it is about hygiene. Whether it is in a hostel where you are worried about bed bugs or outdoors in your sleeping bag – it is more comfortable to sleep in your own inlay. Additionally, you’ll benefit from the peace of mind of sleeping in a hygienic sleeping bag where only you have been in. The second point to emphasise is the protection the inlay offers for down sleeping bags. If you have ever had to wash your down sleeping bag you’ll know it is an arduous undertaking and one has to be extremely careful because otherwise the down might lose its ability to stay fluffy. That’s why most outdoor people barely wash their down sleeping bags and that’s where the Meru inlay sleeping bag comes in handy. The third point where an inlay sleeping bag is useful is in outdoor huts where you have to bring your own sleeping sheet but your outdoor sleeping bag is forbidden. This is often the case in Swiss SAC (Swiss Alpine Club) huts. Fourthly, the Meru inlay works as a perfect sleeping bag in warmer climates such as in Asia. 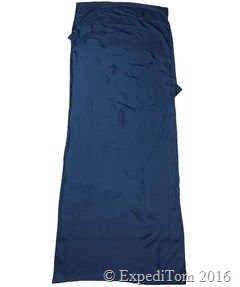 Given its comfortable silk fabric, it’s not too hot and warms you just minutely. This feature of the inlay sleeping bag, leads us to point number five: When you combine the inlay with a down sleeping bag the temperature rating improves, which is very valuable when suddenly the temperature plummets lower than expected. 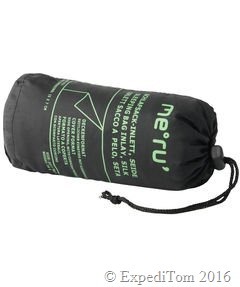 Packed Meru inlay sleeping bag measuring 15 x 6 cm. My conclusion about the Meru inlay sleeping bag is thoroughly positive. It is a great travel companion to create some more hygiene in dubious hostels or save your sleeping bag from dirt. In addition, the inlay can be used in backcountry huts as well as in warm climates where a down sleeping bag is unnecessary. Despite this, it optimizes the temperature rating of your down sleeping bag. 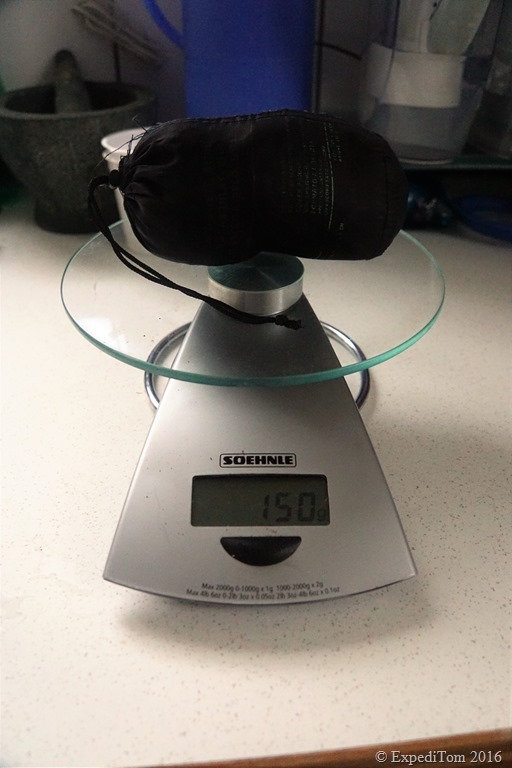 Weighing only 150 grams with measurements of 14 x 6 cm when packed I love taking the Meru inlay sleeping bag on my adventures.